The Komi language (Komi: Коми кыв, transliteration: Komi kyv /komi kɨv/) is a Uralic macrolanguage spoken by the Komi peoples in the northeastern European part of Russia. Komi may be considered a single language with several dialects, or a group of closely related languages, making up one of the two branches of the Permic branch of the family. The other Permic language is Udmurt, to which Komi is closely related. Of the several Komi dialects or languages, two major varieties are recognized, closely related to one another: Komi-Zyrian, the largest group, serves as the literary basis within the Komi Republic; and Komi-Permyak (also called Permyak), spoken in Komi-Permyak Okrug, where it has literary status. A third variety, Komi-Yodzyak is spoken by a small, isolated group of Komi to the north-west of Perm Krai and south of the Komi Republic. The first writing system, the Old Permic script, was invented in the 14th century by the missionary Stepan Khrap, apparently of a Komi mother in Veliky Ustyug. The alphabet shows some similarity to medieval Greek and Cyrillic. In the 16th century this alphabet was replaced by the Russian alphabet with certain modifications for affricates. In the 1920s, the language was written in Molodtsov alphabet, also derived from Cyrillic. In the 1930s it was switched to Latin. Since the 1940s the Komi alphabet was simply changed to the Russian alphabet, albeit with the addition of І, і and Ӧ, ӧ. Letters particular to the Molodtsov alphabet include ԁ, ԃ, ԅ, ԇ, ԉ, ԋ, ԍ, ԏ, where the hooks represent palatalization. The first book published in Komi was a vaccination manual published in 1815. Komi has seven vowels: close /i/, /ɨ/, /u/, mid /e/, /ɘ/, /o/ and low /a/. It has 17 cases, with a rich inventory of local cases. Like other Uralic languages, Komi has no gender. Verbs agree with subjects in person and number (sg/pl). Negation is expressed with an auxiliary verb, which is inflected for person, number and tense. Komi is an agglutinative language and adheres to a subject–object–verb order. Standard Komi-Zyrian (often called simply Komi), based on the dialect of Syktyvkar, the capital of the Komi republic. Standard Komi-Permyak, based on the Southern (Kudymkar) /v/ dialect but the usage of /v/~/l/ is invented artificially from /v/~/l/ (Komi-Zyrian) dialects. Standard Komi-Yazva, it was long considered to be a dialect of Komi-Permyak, but has many unique features, so in 2003 the independent Komi-Yazva alphabet has been introduced. 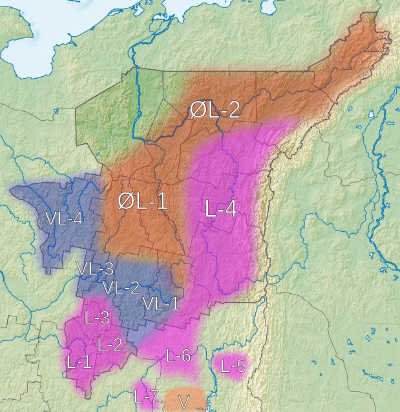 According to Lytkin (1966:44-49; 1976:106–115) and Teplyashina (1976:106–115) the Komi macrolanguage divided into four principal dialect groups or types depending on the development of Proto-Komi *l.
L-type dialects (Kosa-Sysola) retain /l/ in all positions. VL-type dialects (Vychegda) vocalize syllable-final *l into /v/. This creates morphophonological alternation between /v/ and /l/ in stem-final position. ØL-type dialects (Izhma) also vocalize syllable-final *l, but with compensatory lengthening, resulting in a long vowel. This results in similar morphophonological altenations as in the previous group. V-type dialects (Inva) vocalize *l into /v/ in all positions. This division does not clearly correspond with the division into Zyrian, Permyak and Yazva dialects. Komi-Permyak itself divided into three dialects: two /l/ types, Northern (Middle Kama) and Zyuzdino (Upper Kama) and one /v/ type, Southern near Kudymkar, the capital of the Komi-Permyak Okrug. ↑ Hammarström, Harald; Forkel, Robert; Haspelmath, Martin; Bank, Sebastian, eds. (2016). "Komi". Glottolog 2.7. Jena: Max Planck Institute for the Science of Human History. ↑ Saunders, Robert A.; Strukov, Vlad (2010). Historical Dictionary of the Russian Federation. Scarecrow Press. p. 724. ISBN 9780810854758. ↑ Taagepera, Rein (1999). The Finno-Ugric Republics and the Russian State. C, Hurst & Co. p. 313. Fed'un'ova, G.V. Önija komi kyv ('The Modern Komi Language'). Morfologia/Das’töma filologijasa kandidat G.V.Fed'un'ova kipod ulyn. Syktyvkar: Komi n’ebög ledzanin, 2000. 544 pp. ISBN 5-7555-0689-2. Лыткин В. И., Тепляшина Т. И. Пермские языки // Основы финно-угорского языкознания / ИЯ АН СССР. — Т.3. — М.: Наука, 1976. = Lytkin, V. I.; Teplyashina, T. I. "The Permic languages". The Fundamentals of Fenno-Ugric linguistics. (The Academy of Sciences of the USSR.) Vol. 3. Moscow: Nauka, 1976. Современный коми язык / Под ред. проф. В. И. Лыткина. — Сыктывкар: Коми книжное издательство, 1955. = Lytkin, V. I. (ed.) The contemporary Komi language. Syktyvkar, 1966.